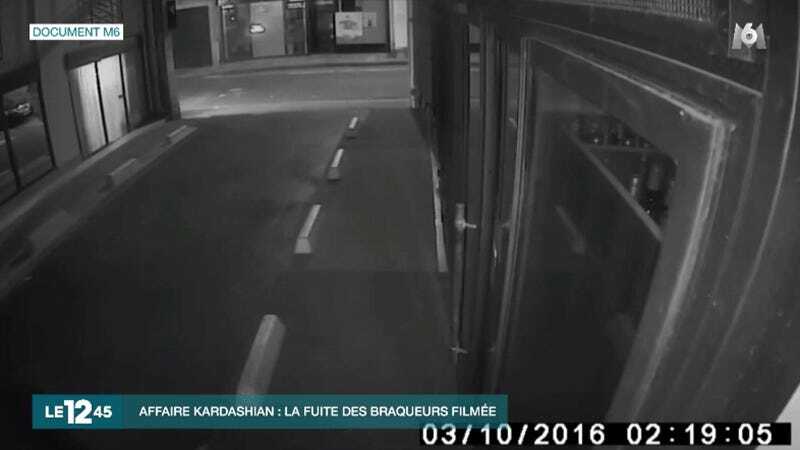 The French TV network M6 has released the first security footage of the suspects in Kim Kardashian’s October 2 robbery in Paris. The black and white footage shows five people—two on bikes, and one on foot—heading down a street near Kim’s hotel at 2:19 in the morning. At 3:07 a.m., the two pedestrians can be seen walking by again, this time in the opposite direction. Though not running, the men are walking at a brisker pace. Just one minute later, they’re followed by the two cyclists, and a few seconds later, the third. The third man is cycling a little more slowly than the other two, and appears to have a bag attached to the handlebar — believed to be the bag in which the robbers collected their loot. The robbers allegedly held Kardashian at gunpoint, tied her up, and left her fearing for her life.